For a century, animators have tried to come up with new gizmos to maketheir cartoons more exciting and more innovative. The Fleischer brothersinvented their "Stereo-Optical Process" that gave their cartoons a 3-Dlook, while other animators tried saving money by simplifyingbackgrounds, or combining animation and live action, or applyingcomputer backgrounds to hand-drawn animation. One innovation that came in the late 1950s never really caught on. Developed by Edwin Gillette, "Synchro-Vox" allowed human mouths to be superimposed over animated faces. Unfortunately, the process required the cartoons to remain as still as possible, so the word "animated" is used loosely and the effect is fairly creepy. "Synchro-Vox" is now available in all its glory in VCI Entertainments' new "Clutch Cargo Cartoon Collection - Vol. 1" DVD. Designed like a mini cliffhanger serial, "Clutch Cargo" came in 20-minute cartoons divided up into five 4-minute segments, each ending with a cliffhanger. World adventurer Clutch (voiced by Richard Cotting) traveled the globe with his sidekicks, a boy named Spinner and a dog called Paddlefoot (both voiced by Margaret Kerry) helping people and solving mysteries. The stories are atrocious and barely make any logical sense, and the static nature of the cartoons causes them to move like lead boots. Yet the series has a charming innocence, not unlike the brand that Lucas and Spielberg tried to recapture in their Indiana Jones films. Even Quentin Tarantino paid tribute to "Clutch Cargo" in Pulp Fiction by running it on a television set just before Christopher Walken's "gold watch" scene. DVD Details: VCI has released 9 complete 20-minute episodes (about 180 minutes) on this single disc, with very good quality picture and sound. 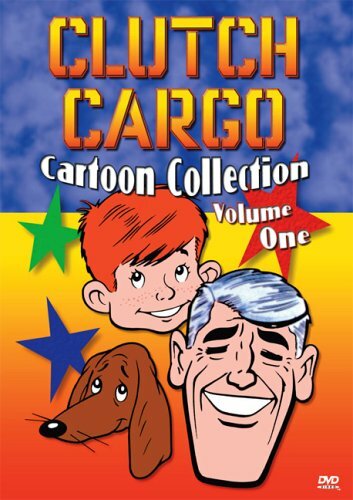 I'm not sure if or when Volume Two is coming, but several other cartoons are already available As Clutch Cargo: The Complete Series Vol. 1 andVol. 2, from BCI Eclipse.